The gold industry has firmly overcome so many obstacles in 2016, while at the same time reinventing itself, that there are no signs of the weakness some analysts talk about. This is the main takeaway from Haywood Securities latest Gold Producers Industry Report. The investment dealer remains constructive on the yellow metal sector by pointing to its relatively stable prices and producers’ optimized operations. “After giving up some early gains, the gold pricehas traded sideways and more recently has shown a degree of strength moving above $1,260 per ounce with the commodity’s ETF balance maintaining a modicum growth. This relatively strenght in price and demand affords a degree of confidence in the underlying equities, which seemingly have retracted back to forward cash flow multiple entertained earlier this year,” the report reads. Gold prices welcomed 2016 with lows of about $1,050 per ounce but moved towards higher trendsas timed passed by, reaching highs around $1,375 per ounce in July. 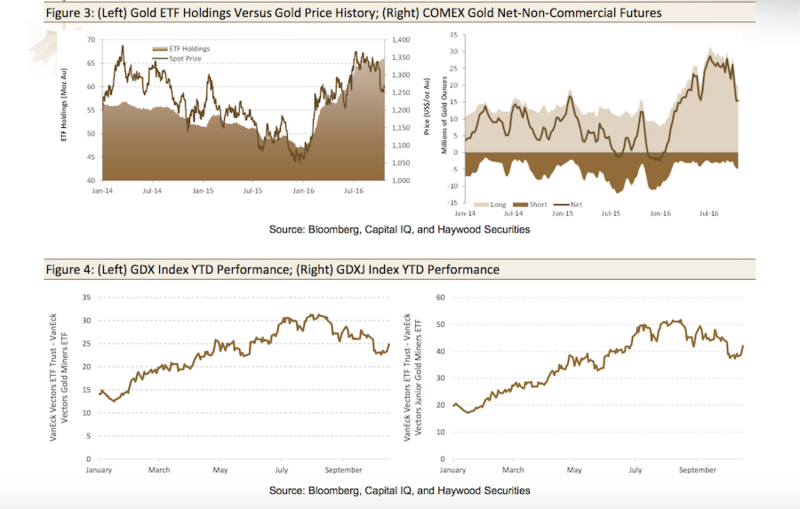 The sector’s gold-related equity prices have echoed the commodity’s trajectory. Haywood explains that the main drivers of the positive turnaround in the sentiment for gold relate to concerns on macroeconomic trends such as changes in global GDP towards more negative outlooks, central bank monetary policy tendencies towards monetary inflation, and economic stimulus engagement engendering movements to progressively lower rates, political whipsawing (e.g., the Brexit vote) and local geopolitical flare-ups. On the supply side, the Canadian firm highlights the fact that the sector has seen winnowed production to fight against a tight commodity price environment. At the same time, producers have managed to lower operation costs and strengthen balance sheets. “This new generation of corporate governance and cost control places the sector in an enviable sweet spot where the companies represent more fundamentally sound investments,” the study states. Senior and mid-tier producers will look to consolidate and buy assets to grow production. Junior producers, who together with mid-tiers are already leading growth with strong balance sheets and cash-flow generating potential, will try to continue the positive trend through production expansion and asset consolidation. Companies with development-stage projects are likely to embark on development plans given the less prohibitive funding environment. They are also likely to become acquisition targets. Brownfield and grassroots exploration will return across the sector as producers look for organic opportunities, and the broader equities market opens up to funding grassroots work.